Midnightsky Fibers: New Bamboo Fiber! Bamboo Fiber, now in my shop and etsy! Super shiny with a silky feel, bamboo is a vegan fiber. It can be spun up light and airy with a halo or fine like silk. Bamboo is renewable and often considered eco friendly- it grows very fast and does not normally need pesticides to grow. Very few people are allergic to bamboo (unlike wool or mohair). 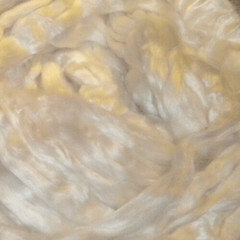 The fiber is 3 to 5 inches long and is in roving/top form for easy spinning, or use like silk in felting.